Discussion in 'Guitars in General' started by FourT6and2, Apr 29, 2016. Currently have two LP Customs. I have a few different pickups I've tried: Duncan JB, BKP Black Dogs, Holy Divers, and Nailbombs. I play '90s - current hard rock, metal, prog rock (Tool, KSE, Muse, Karnivool, Porcupine Tree, etc.). I don't go for a super "modern" high-output type of pickup. I really like the Black Dogs, for example (which are like 9k I think). But years and years ago, I remember playing a Gadow guitar of some sort in a music shop that had Lindy Fralin PAFs and I think they were great. Who here has tried a set (not the Pure PAFs) with a bridge somewhere around 9.5k or so, and plays high-gain stuff? The BKP are great. But... they are almost too clear at times. A little raw character could be a nice change. Another option I've always considered but never tried: Suhr Aldrich. I have a pair of Fralin HOH. Alnico 4, around 13k bridge. I have had this one set for a while, they are in my Les Paul now. Great pickup, a bit of PAF, but bigger and bolder. They clean up and split great too. I have the Pure PAFs in my Custom. They're awesome for everything up to 80s hair metal, but anything after that, they get mushy. Mine are stock wound. 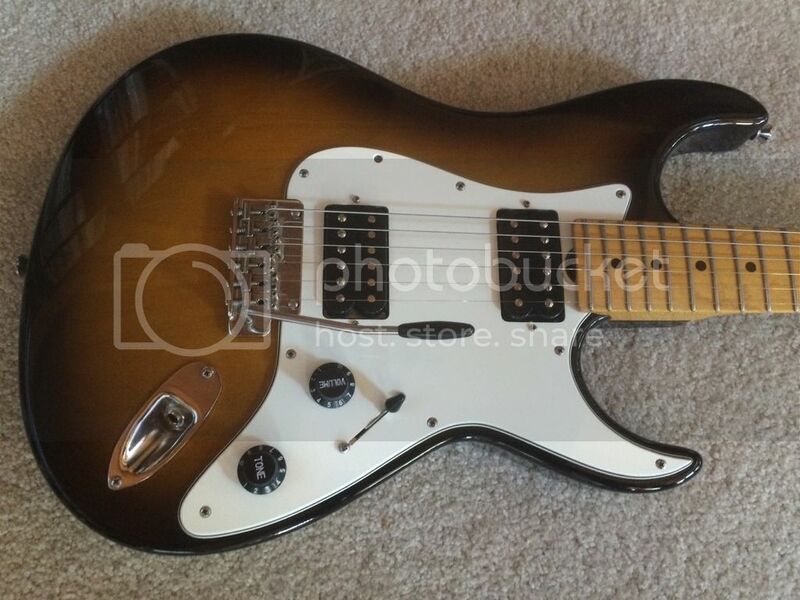 I got an Overwound set of Fralin 8.5k 9.5k in this Grosh RC Strat. = Vivid Harmonics, Sparkling Detail, and Serious Mojo. rapaul76, EL34, Lewguitar and 1 other person like this. I used to run a Fralin 8K/8K set in a 2007 Les Paul Custom through a Mesa Roadster. That combination pretty much nailed all of your points above- not modern sounding, but not really vintage. Clear, but "smears a little" under heavy gain. Lindy has stated that he thinks the 8K/9K set are best for players that play a lot of lead and I agree. i ultimately decided I wanted something a little more vintage sounding and rhythm friendly and swapped them out for PRS 57/08s, but I've hung onto my 8K/9Ks and will likely put them in another guitar soon. I think the Fralin PAFs are fine pups but probably would not give you what you are wanting. I would highly recommend trying the Dimarzio Transition set a try (Steve Lukathers set). They have big output (altho not uber modern by any means) but still a bit of a pushed PAF type of character. Great pups for the styles of music you are describing. Find a couple of non working P.A.F. 's or T-Tops and send them to Lindy for a rewind. To be clear, Fralin's 8K/9K set are not PAF type pickups- they use Alnico 4 magnets and non-vintage spec wire. They were definitely designed with Duncan and Dimarzio more in mind than Gibson. I installed my set on the advice of Mike Lull (his favorite pickup set for Les Pauls). OP- This thread might be a good read. The video below shows the difference between Fralin's Pure PAF and "Standard" 8K/9K pickup designs. Thanks everybody, but I'm not interested in the Pure PAFs. I was asking about the regular PAFs. In any event, I've decided to go a different route anyway. But thanks for the info. And what route is that? Bareknuckle riff raffs are amazing for the just below hard rock sound. Keeping the pickups I have (BKP Black Dogs and Holy Divers). I've decided instead of trying to swap pickups around, I'll get a totally different type of guitar for a different sound. I had a set of Riff Raffs. They were way too bright and harsh for my taste. The Black Dogs are my favorite so far. They have a really thick mid range. Ever thought about the BK Abraxas set ? I have them in a PRS Bernie and they are great. An overwound PAF with plenty of grunt. Rebel Yells are wonderful as well. Did really like the A2's. Pluckier, chewier.